Raise your hands, those who didn’t already suspect Eugene was lying about his cure for the walker plague. If your arm is up, I’ve got two things to tell you. One: I can’t actually see you because that’s not how the Internet works. Two: you haven’t been paying attention to The Walking Dead. In my review of “Slabtown”, I praised executive producer Scott M. Gimple for shaking up the status quo and giving this season a sense of urgency. In contrast, “Self Help” reminds us that, for all his tweaks, the series remains true to the spirit of the source comic book and that said spirit aims to break our own. You’ve got to hand it to The Walking Dead. Five seasons in, the writers are still finding compelling ways to tell the same old story. After all, “Self Help” sticks rather rigidly to the formula my girlfriend denounced last week: the gang finds a potential haven; each character (especially Maggie) yammers on about his or her renewed sense of hope; and then the whole thing falls apart with one possible casualty to hammer the point. The only difference lies in our protagonists putting their faith in a heroic lifestyle instead of a plot of land. Mind you, I didn’t expect the truth to come out so early in the season. Previous arcs of The Walking Dead have tended to favour the slow-burn approach, making “Self Help” feel like one of them “previously on” montages by comparison. I love the economy of language. Take, for example, the mini flashbacks spread throughout the episode. Too short to even be considered scenes, they distil Abraham’s entire back story to its essential beats: a quick pan on the bloody results of his self-defense; a shot of his terrified wife and children; the note saying, “Don’t try to find us”; three mangled corpses; Eugene’s lie. As an aside, did anyone else want to throttle Ellen for abandoning her husband at his most fragile and getting herself and her children killed? In light of her actions, Eugene pretending he’s worth saving really doesn’t seem so bad anymore. It did, after all, save Abraham’s life, providing an incentive for his “Self Help” of sorts. More to the point, lying is a survival skill like any other, and it would take a special kind of hypocrisy to condone murder in the name of self-preservation, as in “Four Walls and a Roof”, but condemn a man for a similarly motivated fib. Tara understands this, and her compassionate reaction to the truth answers a question I’ve never even thought to ask about The Walking Dead: how do the weaker members of the tribe, the Red Shirts if you will, relate to each other? As Abraham points out in “Self Help”, the new world order has more or less culled the meek, leaving the less capable survivors on The Walking Dead up poop creek without a paddle. Tara reasons that she can slowly become one of the strong now that she’s found a community with the patience to let her grow. Intent on paying it forward, the woman agrees to keep Eugene’s secret but insists he learn from her example: “When you’re screwed either way […] you cut to the choice that might help somebody.” I can’t decide whether she’s selling herself short or overestimating the potential of a man who’d waste a tank-full of a potable water just to play hero. I mean, consider Eugene’s final words in “Self Help” before getting knocked out: “I am smarter than you…” You’d figure such a brilliant mind would have known to quit while he’s ahead, but I suppose the former teacher was so consumed with dread that he forgot to factor in his companion’s own despair. 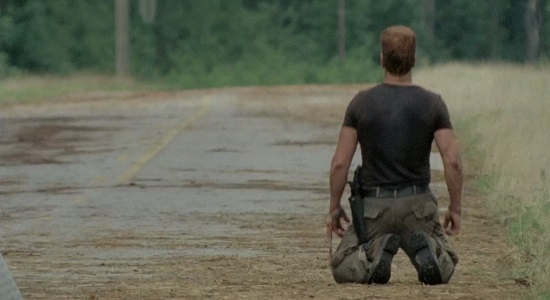 Contrast this oversight with the way Glenn, still my favourite character on The Walking Dead, gets Abraham to rethink his options after the bus crash: “We are going with you […] I just need to know you’re good.” His words are carefully chosen, expressing a firm need but also respect for Abe’s insecurities. Lest we forget, compassion is a survival skill too.